Portraits take center stage at the Whitney Museum’s ongoing exhibit. Curated from the museum’s existing holdings, Human Interest: Portraits from the Whitney’s Collection tracks the evolution of the art form from early 19th century works to the modern selfie. Encompassing two floors of the newly renovated museum, the exhibit includes works produced by nearly 200 different artists, such as Alexander Calder, Marsden Hartley, Edward Hopper, Jasper Johns, Alice Neel, Georgia O’Keeffe, Cindy Sherman, and Andy Warhol. The Whitney’s Scott Rothkopf and Dana Miller curated the more than 250 pieces, which includes paintings, photographs, and drawings. The sheer number of works reflects the Whitney’s longstanding commitment to the figurative tradition, which was championed by its founder, Gertrude Vanderbilt Whitney. Overall, the exhibit reflects the diversity and evolution of the art of portraiture. While once reserved for the rich and famous, modern portraits are taken and posted to social media in an instant. Yet the art form remains relevant. “Through their varied takes on the portrait, the artists represented in Human Interest raise provocative questions about who we are and how we perceive and commemorate others,” the Whitney Museum stated in a press release. The curators organized the works into eleven thematic sections, such as “Portrait of the Artist” and “Portraits without People.” The subjects of the portraits range from everyday people to celebrities to the artists themselves. In the “Body Bared” section, Robert Mapplethorpe ’s controversial “Self Portrait” is included alongside Joan Semmel’s softer depiction of her own body. “Price of Fame” features Rachel Harrison’s pencil drawing of the late singer Amy Winehouse, while “Streetlife” features photos of New Yorkers on the subway. “Institutional Complex” chronicles the American culture of violence. It includes Robert Beck’s “Thirteen Shooters,” which depicts teenagers involved in mass shootings. 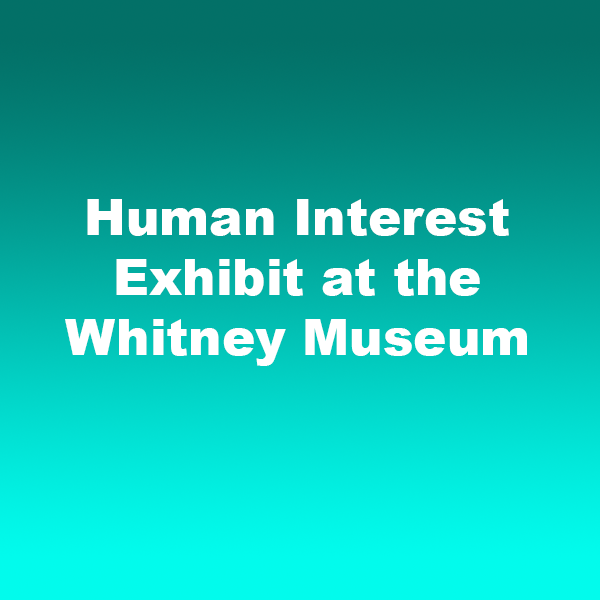 Given the size and variety of the exhibit, Whitney’s second installment in its new location truly something for everyone. Human Interest: Portraits From the Whitney’s Collection runs through February 12, 2017 at the Whitney Museum of American Art, 99 Gansevoort Street, Manhattan. For additional details, visit whitney.org. Does New Lens Adapter Combine the Best of Both Worlds?